Please remember while in the fields and woods this time of year to be careful not to spook the does in the area. May and June are the time they will be giving birth and to me it is important to give them space to do so. Should you find a fawn PLEASE LEAVE IT WHERE IT IS. It is not abandoned by its mother. The mother is out feeding and left her fawn or fawns in what she considers a safe place. Just back away from them and please do not try to touch them. The less human scent you leave the better. Hey who knows the fawn could grow up to look like the Whitetail Deer Buck in the picture below. Hunting white tail deer is one of the most popular sports in the country. You can hunt them with bow and arrows, rifles, hand guns and cameras. They are hunted for food and for the challenge of obtaining a trophy rack, or maybe just a great photo. Hunters who read about world record whitetail deer try and put themselves in the place of the hunter. The thrill of bringing down a giant buck, one with an impressive rack, is something every white tail deer hunter dreams of. Learning about the behavior of white-tail deer begins with a good understanding of how whitetail fawns grow into yearlings and then adults. Does and bucks behave differently of course. A whitetail deer doe will birth up to 3 fawns but most of the time they birth 2 or 1. Later in the summer they may then join a group of other does and fawns. Whitetail bucks roam freely or in bachelor groups but later in the fall the larger more dominate bucks will roam alone, but they do have specific habits that you need to know about in order to have a successful hunt. Whitetail deer are hunted mostly with rifles or bows. Bow hunting whitetail deer presents a hunter with fascinating challenges. But whether you hunt with a gun or a bow, there is a lot of whitetail deer information and deer hunting tips offered by professional and recreational sports persons, which can improve your chances at hunting success. For example, you can learn about deer aging, identifying deer patterns, setting up deer stands, locating funnels, trails, ridges or other places where deer are most likely to be found. The wealth of whitetail deer information that's available reflects the popularity of the sport. If you are an avid hunter or photographer and want to make sure you are doing everything possible to experience successful whitetail deer hunts, you've chosen a great place to start expanding your knowledge of the Whitetail Deer Hunt. I feel you can never have enough Whitetail Deer Information before going to the field. Who knows . . . one of your Whitetail deer may eventually make it into the world record books. But even if it doesn't get recorded officially, in your mind there will always be the giant buck that took unparalleled skill to hunt. That's exactly how the great hunting stories begin! 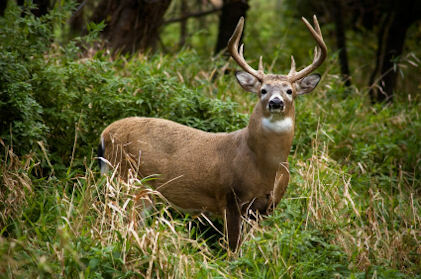 Typical whitetail bucks are deer with symmetrical antlers as defined by the Boone and Crockett, and Pope and Young clubs. Bucks can be typical or non-typical. A great strategy for hunting bucks is to follow a whitetail deer doe when the bucks are in rut. 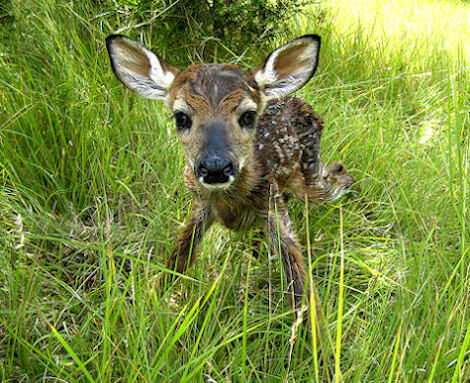 Whitetail deer fawns are born in late spring with spots. By winter they have lost their spots and their coats have changed color. Your guide to building and maintaining whitetail deer food plots that are both cost effective and make the habitat attractive to whitetail deer. The best whitetail deer hunting tips teach hunters how to find the bigger bucks using a variety of techniques during the various hunting seasons. These tips greatly increase the chances of success. Anatomy of a Whitetail Deer illustrations along with some beautiful Whitetail Deer Pictures good for Whitetail Deer Anatomy Hunting reference. Great products related to the Whitetail Deer. 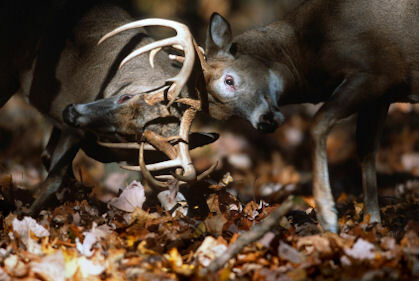 Whitetail Deer Blog - The latest information added to our site. Contact Us page for The Whitetail Deer website. We welcome your comments and questions! My idea for the site came from the fact that most hunters of whitetail deer believe you have to harvest a monster book deer to be a good Whitetail Deer Hunter. I promise to use it only to send you The Whitetail Deer Information E-zine.